Description: This is a set of 14 barnyard accessories, perfect to expand any child's #915 Farm or to play with alone without a barn base. 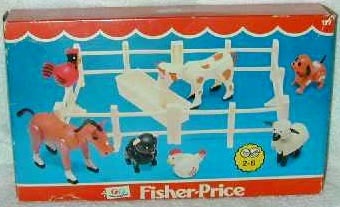 The set includes 7 jointed farm animals, a water trough, and six fence pieces. 6 each - FPT237 - White plastic farmyard style fence section with an old style "KNIFE-WHITTLED" finish. The fence has two horizontal beams set across three vertical upright posts. 1 each - FPT904 - White rectangular feed/watering trough with an open top. The trough is for thirtsy barn animals. Measures 4-1/8" long, 1-3/8" wide, 1" tall. WE or WF - Red chicken (rooster). WC or WD - White chicken. WV or WW - Dark or Light Brown dog with white spots, black facial markings, black ears and a black tail. YJ or YM - Black pig with white ears. YS or YT - White sheep with black ears. Older sets were sold in a box, but later sets were sold on a blister pack. FP117BOX1972 - (BOX ONLY) - This set was sold in a BOX that pictures the #117 Barnyard Friends. FP117SET1972A - (COMPLETE SET MIB) - Complete set MINT IN ORIGINAL BOX (unopened box) that pictures the #117 Barnyard Friends. 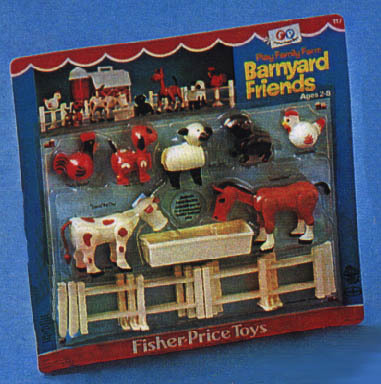 FP117SET1972B - (COMPLETE SET MIB) - Complete set MINT ON BLISTER PACK CARD (unopened) that pictures the #117 Barnyard Friends.